Mugello will play a crucial role for Jorge Lorenzo as his MotoGP future hangs in the balance. The Ducati factory racing team is yet to take a decision on his contract extension with them. MotoGP is already five rounds into the 2018 season and the five-time world champion does not know his status with the team. We have already reported the status of riders and teams for the 2019 MotoGP grid. 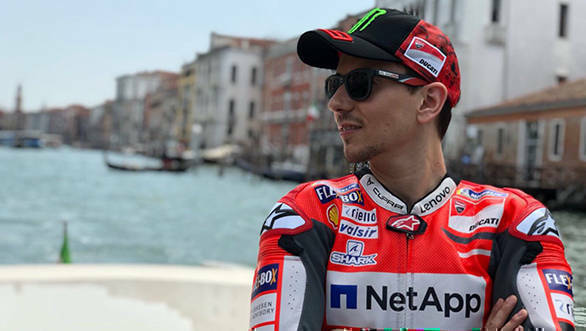 The management and factory bosses have agreed to wait until the first three European races of the season have been run - Mugello is the last - to take a call on Lorenzo's progress with the Ducati GP18 race bike. A picture from Lorenzo's social media with the caption, "We are ready for Mugello"
Meanwhile, the team seems frustrated at not seeing the results they were expecting from Lorenzo. In a possible hint at this, Ducati sporting director Paolo Ciabatti has said that it would be "pointless to go on and on" if the expected results are not forthcoming soon for the team and the rider. If Lorenzo does not deliver, his contract with the Italian factory team will come to an end with the 2018 season. Things had come to a head with the French GP, where Lorenzo finished sixth. Worth noting is the fact that he finished behind satellite team riders Danilo Petrucci and Jack Miller, either of whom Ducati could exercise contract options in its factory team. They have already re-signed a contract with Andrea Dovizioso for 2019. Lorenzo had a dull 2017 season too, with not a single grand prix win. However, Ciabatti says that 2018 scenario is even worse for the rider. "If this chemistry doesn't start to work at the level we expect, which is fighting for winning races, fighting for podiums, then I don't think it's a good idea to continue," Ciabatti said in an interview with crash.net. If Ducati does not work for Lorenzo, Suzuki seemed to have been an option as the Japanese factory team had shown great interest in his skills. However, with the recent announcement of Suzuki's interest in the debut of Moto2 rider Joan Mir in the premier class, there may be even fewer options left for him. Ciabatti stated that they too were in for interested in the 20-year-old, but feel they may not be able to offer him a position on the factory team, which Honda and Suzuki could. So, dear Jorge, we sure hope you can pull one out of the ol' hat this weekend at Mugello. And he will have to, given the confidence he has shown about his status in MotoGP. In an interview, Lorenzo said that retirement is not an option at all for him. "I will continue for the next two years. I will not retire. And I will be with a good bike. This is the only thing I can say," he said.